What features of your home communicate the essence of who you are? Sure, the color you choose for your siding probably says something about you (we’ve all seen that hot pink siding paint on a structure and thought, my goodness, what an odd choice…). Of course, your yard also communicates some of your personality to passersby (again, we’ve all seen that yard peppered with 50+ lawn ornaments and made some conclusions about the homeowner…). But, we want to address another area that can communicate just as strongly who you are and what you are all about: your entry door. Hot pink siding and yard trinkets aside, few home features represent your family as much as the entryway does; specifically, your entry door. What does yours currently suggest about you? Or, perhaps the more important question to ask: what do you want your entry door to suggest about you? You want it to convey a warm and inviting impression, of course! Now, we know you can choose anywhere to replace and upgrade your home. Of course, we at Brock Doors and Windows would love to earn your business and bring your entryway back to life with you! So, why Brock? Over 70,000 Quality Installations: we have the experience to back our guarantee to you—that your Toronto entry door will be installed properly the first time. Over 27 years in the industry: we love what we do, we do it well, and we look forward to the next 27 years of service to the Greater Toronto Area! More than 100 Committed Employees: we don’t “farm-out” our contracts, we service our clients directly. Want to meet the Brock professional who will be working on your home project? Stop by! We want to meet you! Awards: we are so proud of the recognition that our ethos and workmanship have earned within the industry, such as HomeStars Best of 2011 Award, 2010-2015 Readers’ Choice Diamond Awards, 2016-2017 Consumer Choice Awards, 2016-2017 Top choice Award. Really, the choice is yours. You can choose any company to handle your installation, but we hope you choose Brock. Have questions? Want to compare our entry doors with other options? 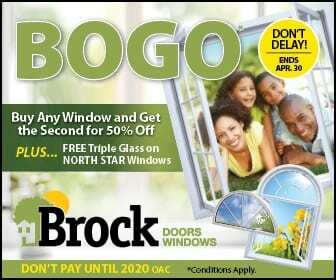 Stop by our showroom in Brampton Monday – Friday from 9 am to 5 pm, or Saturday from 10 am to 3 pm. We look forward to meeting you!